WELCOME to Artful Dodge, an Ohio-based literary magazine that publishes work with a strong sense of place and cultural landscape. Besides new American fiction, poetry and narrative essay, we're also interested in contemporary literature in translation — from all over the globe. Our magazine is available through independent and chain bookstores nationwide, and directly through us. If your local bookstore doesn't offer Artful Dodge, ask for them to carry it, or write to us with the name of your bookstore, and we'll see what we can do to bring our pages to other readers around you. Yes, you've heard right--Artful Dodge 52/53 is hot off the presses! We're looking right into the mouth of the American condition--that is to say we're not doctors, and we haven't quite figured out what the condition is yet. All we know is that we're hearing a voice, quite a few of them actually, and despite what the psychologists think, those voices are real. They're right here in front of us, in the pages, waiting to be heard and read. This issue features plenty of new and exciting works, including a new cover format, which displays a full-cover wrap-around photo of a tractor--but it's not just any tractor. No, this guy is red hot from Stephen Tomasko's collection "First Place and Our Congratulations." Make sure to flip to the back cover to see the rest of the mud-splattered glory. You'll know right away that John Deere has nothing on this guy. Hop right in to read Jay Hopler's two poems and a collection of poetry in translation from Georg Trakl. Trakl was an Austrian Expressionist poet, perhaps best known for his poem "Grodek." Trakl quickly came to be considered one of the most important poets writing in the German language. Despite his relatively short life, Trakl managed to artfully weave poems rich in color and imagery of a world disintegrating into war. Hopler departs from various other previous translations, which generally translated lines word for word, and instead re-imagines these poems as prose poetry in order to capture the power of the original German and elicit a more emotive reading that reaches deeper and allows the line to transcend itself as a conveyor belt of information. This issue also includes interviews with Brian Turner, winner of the Beatrice Hawley Award for his debut collection of poetry, Here, Bullet, and Sharon Olds, who won the Pulitzer Prize for her collection, Stag's Leap. When asked about facets of his inspiration for writing, Turner mentions that often "[Arabic] phrases felt like signposts or guideposts to help me into the poem; or, when I was in the poem, they seemed like stepping stones that helped me get from one part of the poem to another." Turner's care in explaining his experiences writing shows us one thing for sure: our identity as American writers runs deeper than the country itself--we cannot separate ourselves from the world if we claim to be authentically American. Likewise, Sharon Olds reveals that her past follows her, and her religious upbringing does not limit her the way she originally thought it may have. Although she says "My friend who was Catholic confessed and was forgiven. But for me this was not available," Olds also finds that direct route of her childhood faith was not altogether barred from her when she discovered her poetry has "no end rhyme, there were very few end stops, and the enjambment worked, to disguise from my eyes the fact that my model was a church hymn." Both Turnere and Olds find their poetry emerging from negative spaces in order to acheive something that is greater than the experiences themselves. These poets are obviously more than just the awards they carry, so be sure to check out their full interviews. Next, Lavonne J. Adams explores the ties between objects and humanity in her poems that detail various Native American (and other) artifacts found in museums in New Mexico, and inspired by the accounts of Navajo and white interactions on and around the Santa Fr trail in the mid 1800s. In the selection offered in 52/53, Adams works to give voice to Navajo experience, which is often overlooked by mainstream history texts. Her poems offer a starting point to understanding a more dynamic relationship in the voices of American history. So, take a moment, take a few. Learn how to disconnect and reconnect with Joshua Flaccavento. Let Nin Andrews tell you all about orgasms. Wake up in one body and realize it is not the one you remember, your children and wife and husband and parents are all different people now. With each page, discover a new landscape. Perhaps we'll find a diagnosis along the way. Thanks to our distributor, Ubiquity Distributors, we have a list of places you can find Artful Dodge 52/53. If the shop doesn't have it, make sure to ask for Artful Dodge by name. Maybe they've sold out, and will ask Ubiquity for more copies. Also, while you're there, buy another literary journal and support both new writing as well as independent book stores! We have transitioned to online submissions! Artful Dodge's online submissions portal will be open for the first time September 1st and will close November 30th. Be sure to check back in for future updates! For more information on submitting your manuscripts to our literary magazine, please visit the Writer's Guidelines and keep in touch via our blog at Wordpress.com! Artful Dodge Featured in The Wooster Voice (Feb. 2017). Editor-in-chief Daniel Bourne's new poem appears in Plume Poetry, 2016. Daniel Bourne publishes audio poem in RHINO journal, 2015. 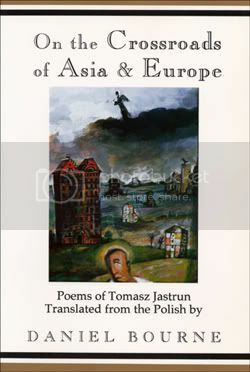 Also available from Artful Dodge: On the Crossroads of Asia and Europe, a collection of poetry and satirical prose of Polish writer Tomasz Jastrun, winner of the 1983 "S Prize" from Underground Solidarity for his poetry during Poland's martial law period in the early 1980's. For excerpts and information on placing orders for On the Crossroads of Asia and Europe, click here.